Well, we are in La Paz still. We´ve actually found a great place to stay so we´ve decided to hang out for a bit here in this city. We will head to Sucre or maybe Cochabamba on Sunday, but we will have to see how things go. I was remarking in my last post about how strange it is to see people from distinct cultures or places ¨acting¨ or sort of performing for the tourist cameras. Anyone who comes from a heavily touristed place will understand what I´m talking about. Things can get even weirder when the average daily income in a place is 100 times less what it is in your country. When I saw the villagers of the Uros Islands greeting us with a familiar greeting in forced unison it reminded me of the TV show FAntasy Island where all visitors recieved a Lei and drink with an umbrella in it as soon as they stepped off the plane. I found myself being constantly on-gaurd for this kind of behavior. For awhile anyone in customary indiginous dress that seemed a little too clean or made-up I regarded as a ¨performer¨ and it made all sorts of things seem staged to me. Much like the Native carver I once saw Japanese tourists videoing at the mouth of the Capilano Suspension Bridge, these people seemed to be putting on a show. I suppose we´ve all done similar things - especially for money, but when the behavior is extended into the confines of your home, it seems even weirder. Hayley was good enough to point out, however, that while a lot of men on the Island of Taquile, for example, wore customary dress when soliciting rooms for the night and then changed into more mass-fabricated modern clothes for the morning chores, most indiginous women of these communities continued to wear their traditional clothes at all times. Maybe it´s not all a performance then. I´m still not sure. If you go to NYC and get a cab, do you think that guy is being particularly familiar and projecting a NYC attitude to help the tourist have an authentic experience? Hard to say I guess... Well, enough of that. 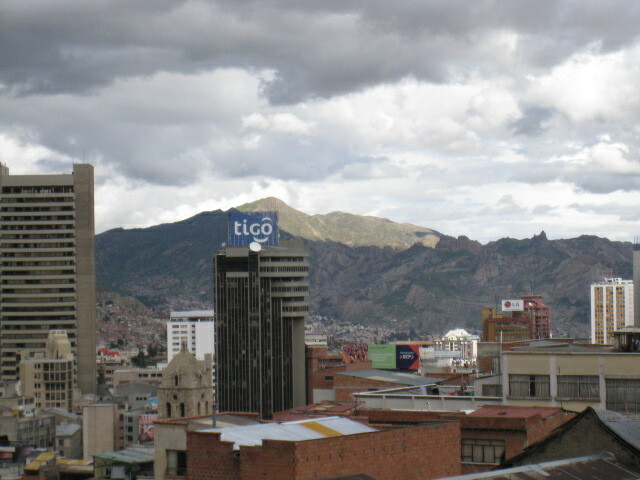 WE are currently in La Paz which is a big city and full of all kinds of inauthentic and authentic people alike. The sprawl of La Paz up above the valley is called El Alto and it´s the Ayamara capitol of the world I´m told. I´m pretty sure most people are too busy hustling here to worry too much about weather or not things look good for the tourists. What I do know is that this snack food known as a Saltena and is basically a baked empanada full of juicy meat or veg stew is constantly orbiting around in my mind as I walk the streets and wonder what we should do for lunch. sooo jealous of you two! glad to see you completely escaped the olympics! i hope you subletted to bank roll the trip! give us an email when you get back sweet cheeks!!!! !